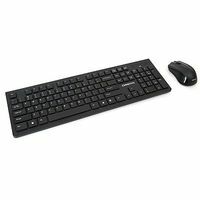 A modern set of wireless low-profile multimedia keyboard, with 13 multimedia keys and optical mouse 1200dpi. The buttons are very low and convenient profile, their construction uses a special membranes, which provide high quality and convenience. The keyboard has an ergonomic shape and because of the thoughtful design is extremely functional in use. The mouse is equipped with high-quality optical sensor with 1200dpi resolution, wide rubber scroll and comfortable housing.